A series of beautiful, monochrome portraits by Hisaji Hara who has modelled his photographic compositions upon paintings by Balthus (1908-2001), one of the most revered and controversial artists of the twentieth century, will go on display to the public at Michael Hoppen Gallery this Friday. In the style of the Modern Master, Hara creates scenes imbued with an unsettling combination of innocence and eroticism. The models have the light, unselfconscious attitudes of playful children and yet their postures invite the eye to see them as sexual young women. Moreover, in reinventing the pictures, Hisaji Hara has chosen to dress his teenage subjects in school uniform, thereby emphasizing the uncomfortable transitional period between child- and adulthood. We feel as if we are the quiet, almost intrusive voyeurs to moments of youthful innocence. Hisaji Hara is technically brilliant and very meticulous in his preparation for each image. The stage-set for these photographs is the derelict building of a privately run medical clinic used in the 1940s and 50s. In order to emulate the depth and eerie atmosphere found in Balthus' paintings, Hara employs a number of techniques that transcend the use of photographic craft alone in order to mimic the skewed perspective of Balthus' work, including smoke machines, specially commissioned furniture and unseen additions to his subjects’ costumes to create a strange angularity to their dress. Hara's camera skills are evident in the use of multiple exposures and focuses whilst partially blocking the lens to create unusual depths of field which only add to the mystery of the scenes. The exhibition finishes on 31 March 2012. What we see here are unique paper negatives from the 1850’s by some of the greatest old master photographers, a small but perfectly formed exhibition of which opens today at the London arm of Daniel Blau Gallery. They are the true originals, created by the light reflecting off the photographed subject. For their beauty, Zeitgeist, rarity and provenance they rank amongst the greatest treasures of photography. The paper negative had its heyday for a brief period in the early days of photography until circa 1860. Because the negative is the plate from which a multitude of positive prints can be made, it normally remained in the photographer’s possession during his lifetime. Only later would it enter into public collections by will of the photo-grapher or the family’s donation. It is rare to find negatives by famous artists such as Le Secq, Nègre, de Beaucorps or de Clercq in private hands. A negative can be so much more evocative than a positive print. We realise from the blurred movement of the clock’s hand on the picture of the Palazzo Vecchio that it took three minutes of exposure time to take the photo, long enough to empty the square of all the people moving about. Their movements made them invisible to the camera. Only the building remains in its static existence with the guard’s rifles leaning against the wall. Like a printing plate, the photographic negative has long been regarded as a stage in a working process. Surrealism and other lessons in art have taught us how to look at the more abstract pictures of the world. We have since begun to appreciate the photographic paper negative with its saturated, ominous dark against the ethereal pale as a work of art in its own mysterious beauty. 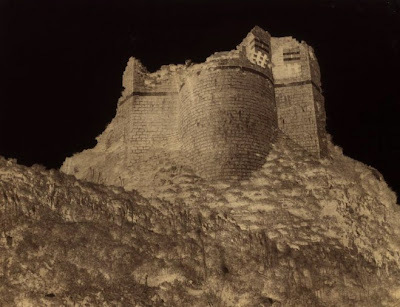 This is truly a prized opportunity to see such precious photographs outside of a museum context, some of which are even magically backlit and are sure to transfix the connoisseurs of nineteenth century photography amongst our readers. Photographer's Own: Paper Negatives runs until 31 March. With little over two weeks left to apply for the next 1000 Words Workshop with Roger Ballen in Fez, Morocco (5-9 May 2012), we thought we would bring you up to date with some recent news. The workshop has managed to attract notable press here on The Daily Telegraph online and here at GUP Magazine, while Roger Ballen has been busy directing his first music video, the oddly engrossing, I Fink U Freeky for Die Antwoord to widespread critical acclaim, receiving more than 1 million viewers on Youtube in less than 24 hours. 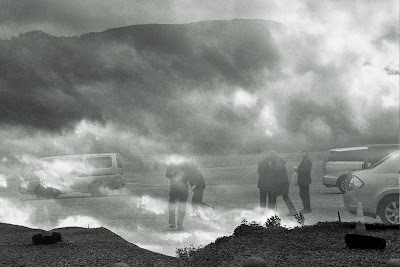 At the same time, he has been working towards the first major UK exhibition of his photography this spring, at Manchester Art Gallery which will explore three decades of Ballen's career, and be on show from March 30 until May 13. New, previously-unseen work will also be showcased in the forthcoming issue of 1000 Words - Uncertainty - out 3 March. If you are considering applying but are wondering if this opportunity is really for you, have a read of the testimonial from a previous workshop participant below to get an idea of what you can expect. Whether it be fresh approach to your photography or a desire for new experiences, it's time to challenge conventional thinking and shake things up. With a strong onus on image-making, photographers who have attended our workshops in the past have done so with great success, and, in the process, produced new bodies of work that have since been featured in magazines such as The British Journal of Photography, released in the form of books with publishers including Max Strom or gained them representation from the prestigious Prospekt agency to name just a few. Here is a Saskia Vredeveld film titled Memento Mori from 2005 about the weird and wonderful world of Roger Ballen that should get those grey cells ticking. "The workshop in Fez was a mind shaking experience, and for me that was just what I needed! Antoine's repeated question to me was, "but what do you want?" What a simple question it may seem but to truly honestly answer this was one of the hardest things. Antoine struggled with me daily to be truthful to the process of shooting and to my work. Trying to do this as a white woman in a muslim foreign country seemed scary at first. But soon enough this fear pushed me to go farther than I had before. To take more risks and be more bold. In the end, I had allowed myself to befriend men and women who were at first just strangers on the street. My once beautiful but safely intimate portraiture became more real for me, evoking not only the fear of letting myself leap in a strange place but in the process of doing so, being able to see so much more in others. The workshop venue was such a treat and incredible place to be able to go to every day. A sanctuary to rest and to edit and collect your thoughts. A place to run into your fellow work shoppers and bounce around ideas. The food was more than I had expected and in fact pretty much the best food I ate in Morocco in my three weeks travel. Tim and Michael were so on top of the workshop; they were there managing every detail from accommodations, food, coordinating the class meetings, running film to labs, scanning, and even just being sweet and kind pals to talk with about your day or have a beer with and brainstorm about your project. Click here to apply. The deadline for submissions is 1 March 2012. 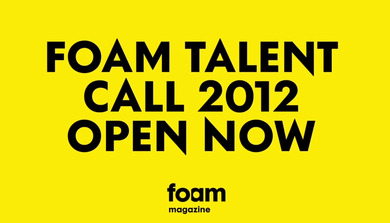 The magnificent FOAM are looking for the world's next photography talent. The winners will get the chance to have their work published in Foam Magazine, a distinctive and highly regarded international photography magazine. Photographers can submit and upload their portfolios simply using this Facebook app on the Foam Magazine Facebook page. The sixth edition of Foam Talent Call opened on 30 January and this year photographers can submit their work for the first time via Facebook. With over 800 submissions last year, they are understandably excited to see how many they receive this year via Facebook. It is not necessary to have a Facebook to enter the call. The Foam Talent issue is designed to showcase young photographers from all over the world. It is described as "a career building platform, launching aspiring talents into the international photography industry, giving them international acclaim and recognition". A few examples of well known photographers who have been showcased in the Foam Talent issue are: Mayumi Hosokura from issue #28, Benjamin Lowy from issue #24, Alexander Gronsky and Anouk Kruithof from issue #20, and Curis Mann and Pieter Hugo from issue #16. The call is open to all photographers aged between 18-35 across the globe. The entrance fee is 35 euro and the competition is fierce, but 15 selected talents will receive an eight page portfolio showcasing their series along with an interview by an esteemed writer. The editorial board will choose the portfolios according to the creative vision and concept of the series presented, amongst other criteria. Submission closes on 16 April 2012. More information can be found here. At the heart of Japanese photographer Akiko Takizawa’s work lies feelings of dislocation, displacement and isolation. Her black and white photographs, unsettling yet peaceful, are imbued with a sense of loss and longing while retaining that vital glimmer of hope. Dim shafts of light creep into dusty, shadow-shrouded interiors or softly illuminate barren landscapes. The images seem suspended between a dreamlike and wakeful state, teetering at the threshold of consciousness. The line between sleep and death, death and life is tantalisingly blurred. Her most recent exhibition, Over the Parched Field, on display at Daiwa Anglo-Japanese Foundation, London from 18 January to 1 March, showcases a selection of collotype prints of Takizawa's work from the last six years, photographs she describes as "semi-autobiographical". Taken at the shrines of Osorezan (Fear Mountain) and Goshogawara in county Aomori in the north of Japan, they depict holy places that were created to memorialise and heal the spirits of children who have passed away. Stone statues adorn the volcanic landscape, protecting the souls of the deceased, while ‘bridal’ shrines are draped with mementoes, left by parents for their children when they come of age. Takizawa describes it as a place of calm that heightened her sense of solitude. Gemma Padley is the Features Editor at Amateur Photographer Magazine and is currently studying a Masters in the History of Art with Photography at Birkbeck University.